The City of Melbourne has issued a fine for not voting at the 2012 Municipal election even though they were not entitled to remain on the municipal role. The person concerned had moved house in the weeks before the October 2012 Council and as such lost her entitlement to vote. Earlier this year the City of Melbourne issued fines for not voting. Appalled by council’s administrative error they wrote to the City of Melbourne and informed them that she did not live within the municipality at the time and as such was not entitled to vote. The City Council wrote back rejecting her application to have the fine revoked and increased the fines value. A situation that has caused considerable stress resulting in her having to seek medical attention and delays in paying her rent in the days leading up to Chirstmas. The Melbourne City Council failed to explain on what basis they rejected her request to have the fine revoked. The matter now has to go to court in order to right the wrong. More stress and more costs involved. Entitlements relating to enrolment (1) A person can only be enrolled on the voters‘ roll of a Council if the person is a resident in the municipal district of the Council or a ratepayer to the Council exercising an entitlement under and in accordance with this Division. METRO councils are under fire for spending more than $100 million a year on generous salaries for a small army of senior bureaucrats. Melbourne City Council is the top employer with more than 130 senior officers earning at least $130,000 a year, including 18 executives getting $200,000-plus. The council copped flak earlier this year when it increased CBD on-street parking fees by nearly 40 per cent and introduced a $5 fare for its tourist shuttle bus. A Herald Sun analysis of 19 metro councils, which have released their annual reports, reveals they have more than 500 staff classed as senior officers earning $130,000-plus salaries. The revelation comes just weeks after a major State Government survey found that more than 90 per cent of Victorians believed their councils could improve, with low scores given for management of roads, population growth and planning policy. In 2012-13, the City of Melbourne spent $21.3 million on senior officer salaries, with CEO Kathy Alexander the state’s highest-paid municipal executive on a package of about $440,000. Ratepayers Victoria president Jack Davis said that too much of councils’ rates revenue went into administration. “We have far too many people employed by councils but not many workers,” he said. Dr Alexander said that Melbourne was a major council with a budget of $450 million and more than 1200 staff, including senior roles like divisional directors, branch managers and senior project staff. “The national and international accolades the City of Melbourne has this year received in areas such as city safety, sustainability and climate change adaptation are an indication of the leadership, significant professional and technical expertise and experience of our staff,” she said. Dr Alexander said the number of senior officers had increased by 19 since last year but this was existing staff who had moved into a higher pay scale after an EBA wage rise. “The figures quoted in the annual report relate to a total employment package that includes salary, superannuation, vehicles and leave loading,” she said. Among other councils, outer south-eastern Casey had 31 officers earning $130,000-plus, including five getting more than $200,000. Boroondara had 27 staff in the senior officer category, with four people getting at least $200,000, while Port Phillip, Greater Dandenong and Knox had 25 staff on the senior salary package. Of the councils surveyed, Nillumbik had the least senior officers, with six, including two on $200,000-plus packages. the City of Mlebourhe has still failed to address residents South of the Yarra concerns over planning. Changes to Melbourne’s Planning Scheme was sidelined by Coucnil Staff who were caught out sleeping on the job. Previously licenced premises such as a tavern along Domain Road required a planning permit now they are an as of right use. State member Clem Newton-Brown is yet to address this issue. On 15 July 2013 the Minister for Planning introduced new commercial zones and modified industrial zones into all planning schemes in Victoria. the Commercial 2 Zone replaced the Business 3 and Business 4 Zones. Generally the new commercial zones broaden the range of activities that are allowed, without the need for a planning permit and remove existing floor area restrictions. Allows tavern, hotel, and gaming premises without a planning permit, unless in a strip shopping centre where gaming premises are prohibited (a permit for a liquor license will however still be required). Exempts buildings and works from notice and appeal rights, unless the land is within 30 metres of a residential zone, a hospital or an education centre. The following IP address has been engaged in abusive threatening comments. We know who you are and your abusive threatening comments and IP logged. The City of Melbourne has scheduled September 11 for the holding of a Citizenship Ceremony. Citizenship ceremonies, like birthdays and anniversaries, are a date to remember. Those unfortunate new citizens who are scheduled to become citizens at this ceremony will have to endure the rememberance of this date for the rest of their lives. A date for money not celebration. State Member for Albert Park Martin Foley, who represents the State seat of Albert Park and the Fisherman’s Bend precinct, has criticised the deal calling on the State Government and Planning Minister to commit to “inclusive and effective consultation”. The City of Melbourne can not even manage a building site on Swanston Street not to mention problems associated with traffic management and Melbourne’ bicycle network. Why make them think they are best to take over control of the Fishermans Bend redevelopment? Confidence in the City Council is in decline. the Council holds most of its meetings behind closed doors and its minutes of meetings are not accurate or true. It’s failure to ensure public safety on the Swanston Square project site are just a few of problems facing the Council. In the absence of rational debate about a possible merger between the two cities and the establishment of a Greater Melbourne the best solution for the redevelopment of the Fisherman’s Bend site is an independent development authority that includes representatives from both Municipalities and the State Government. Do we really want the City of Melbourne managing the proposed Fishermans Bend re-development? 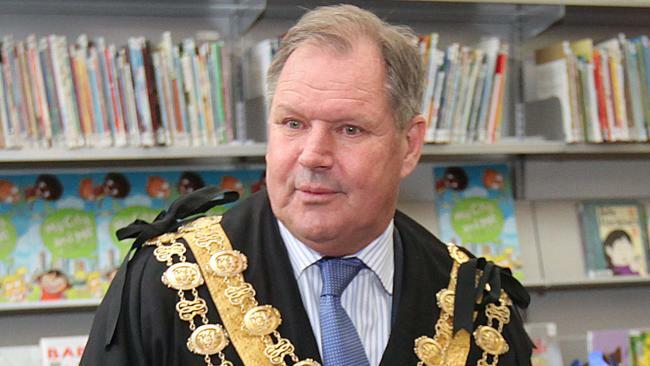 Lord Mayor Robert Doyle has unilaterally proposed that the City of Melbourne’s external boundaries be altered so it can propose to the State government that it be the proposed redevelopment authority. The proposal which first appeared in the Age had the City of Port Phillip up in arms with Port Phillip Councillors attending the City of Melbourne meeting expressing their dismay at the proposed boundary change without first consulting the Port Phillip Council. Bowing to developers pressure the State Government is most likely to appoint an independent development authority to over see the Fishmens bend site as it did in redeveloping Docklands. There were clear problems with the Docklands development but do we really think the City of Melbourne will do a better job given they can not even mange a safe work environment for the Swanston Street CUB development site? Given that the redevelopment will have a significant impact non the City of Port Phillip should not Port Phillip have the lead say in the re-development plans?